Versatile. 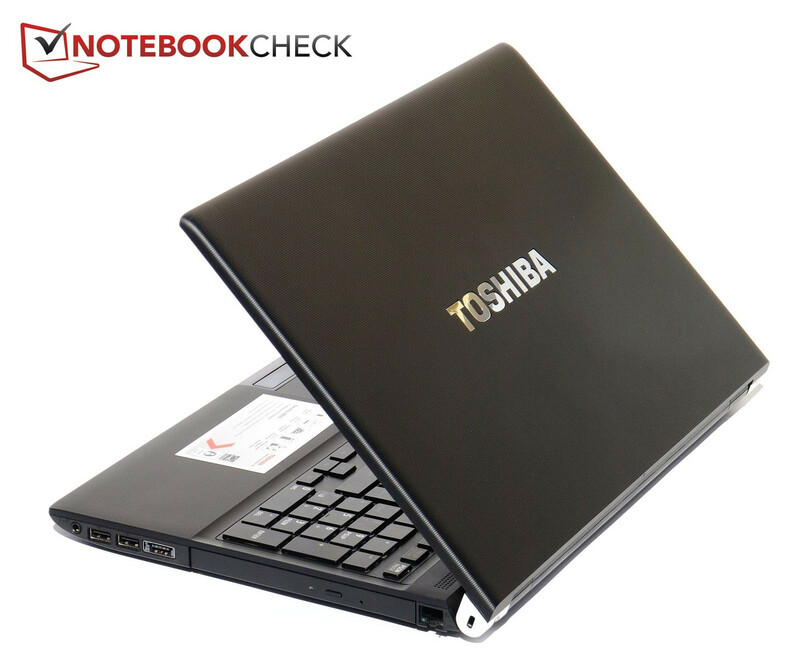 Toshiba offers a well manufactured 15.6 inch notebook with adequate performance, a vast scope of interfaces, a matt display and good battery life for around 999€. This Satellite R850-127 can either be seen as a multimedia or a business laptop. 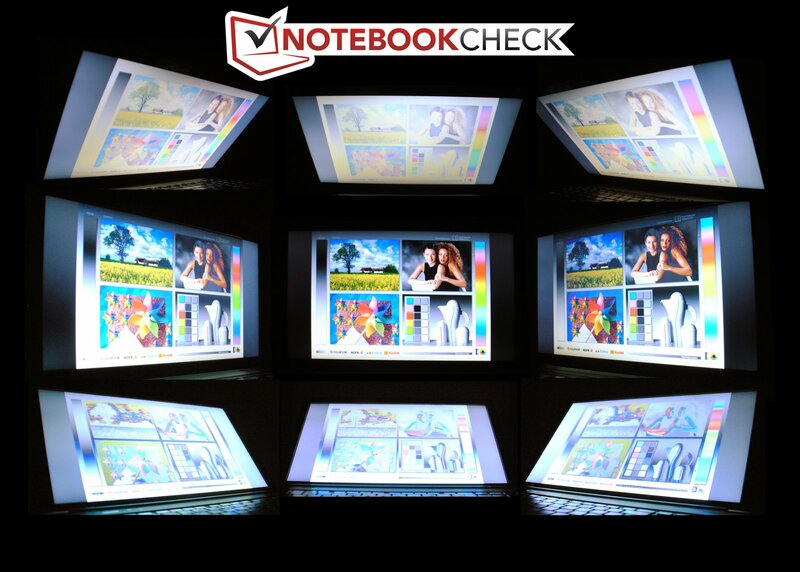 The notebook is available in retail with state of the art equipment. The popular Intel Core i5-2410M takes care of processing jobs and the graphics solution is the rather unknown Radeon HD 6450M from AMD. The latter has a dedicated 1GB DDR3 RAM. An in-house, 128 GB SSD is installed into the -127 configuration as the mass memory. 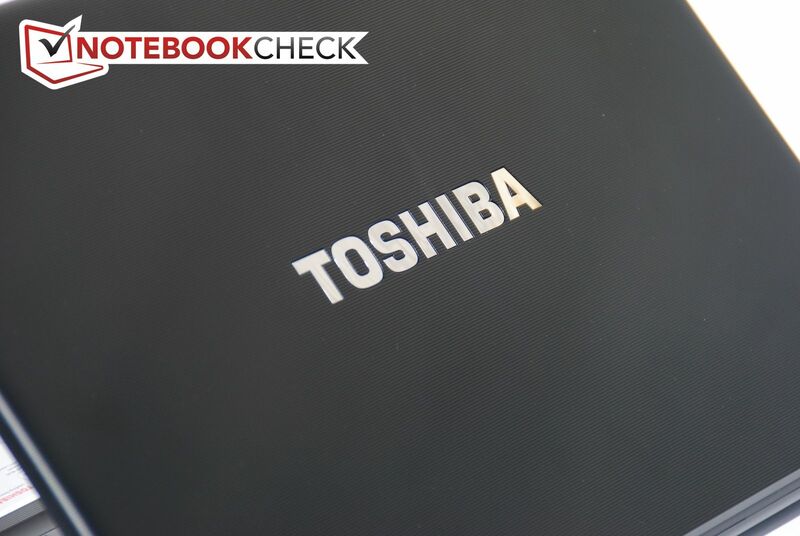 The Satellite R850 is a slimmed down version of Toshiba's Tecra business range and has a very similar build compared with the formerly tested Tecra R850-11P. However, all business features have been removed and it doesn't have a docking port, fingerprint reader, trackpoint or Internet via a built-in mobile broadband. The display port has been replaced by a HDMI port and the 500 GB hard disk has been exchanged for an SSD, in the case of our test device. Besides that, an AMD graphics card has been installed. Is this version still convincing, or is even the laptop uncertain whether it's to preferably appeal to corporate customers or consumers? 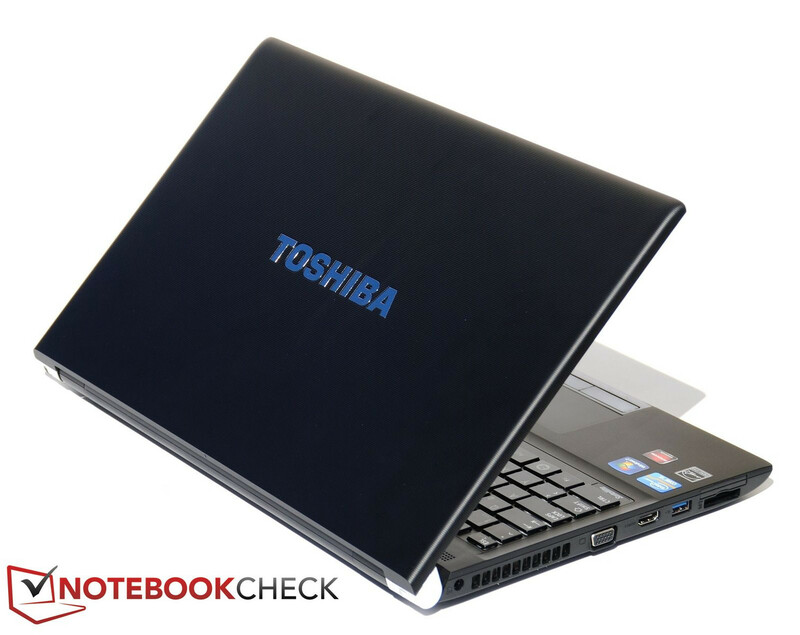 The Toshiba Satellite R850 is made in matt black for the most part. Merely the hinges and touchpad keys have been coated with glossy silver paint. The wrist rest and the display have a lined texture. Otherwise only smooth, matt, black plastic surfaces are found. They have a high-quality feel and give fingerprints as well as grease stains a hard time. 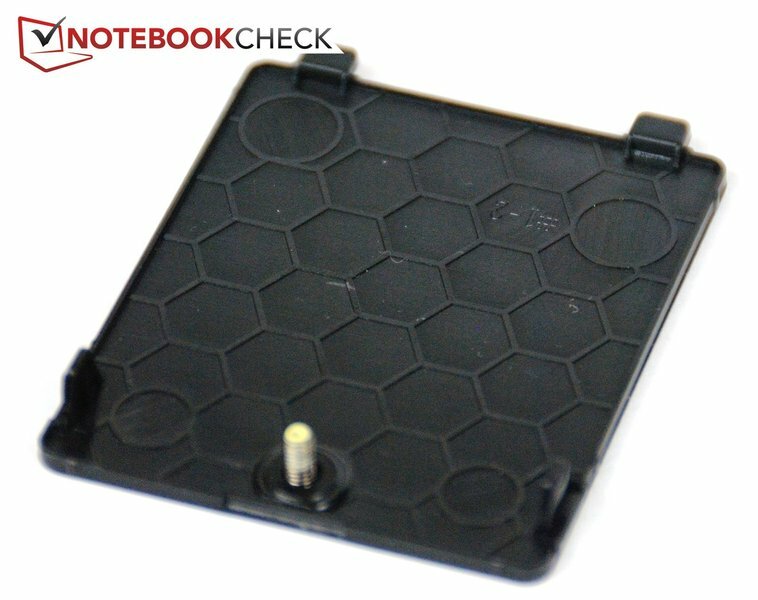 The manufacturer heralds its notebook to be particularly stable due to a honeycomb structure inside, among other things. And actually, the base unit can only be twisted to an extent with a lot of force and plaintive creaking. The wrist rest and the area behind the keyboard can't be depressed. The case merely yields a bit over the optical drive's bay. The honeycomb structure doesn't seem to have been continued as consistently on the bottom. This could be due to the four maintenance covers that take up about one third of the bottom. Merely moderate pressure suffices to deform the plastic here. The battery has a tight fit in its holder. The base unit has to be held down when opening the 8mm thick display lid because it would also lift otherwise. We also needed both hands to twist the display. The display lid can only be depressed slightly with modest force. The hinges have a secure hold on the display but tend to let it teeter a bit. Overall, the laptop's stability is still within an acceptable range though. 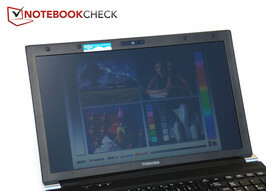 Toshiba has bestowed the notebook generously with interfaces. Thus, in addition to both USB 2.0 ports and Ethernet socket, there is also an eSATA/USB 2.0 combo port (front right) with power charge function. If you don't want to or cannot use very thin plugs, you won't be able to use all USB ports because they are placed very close to one another. 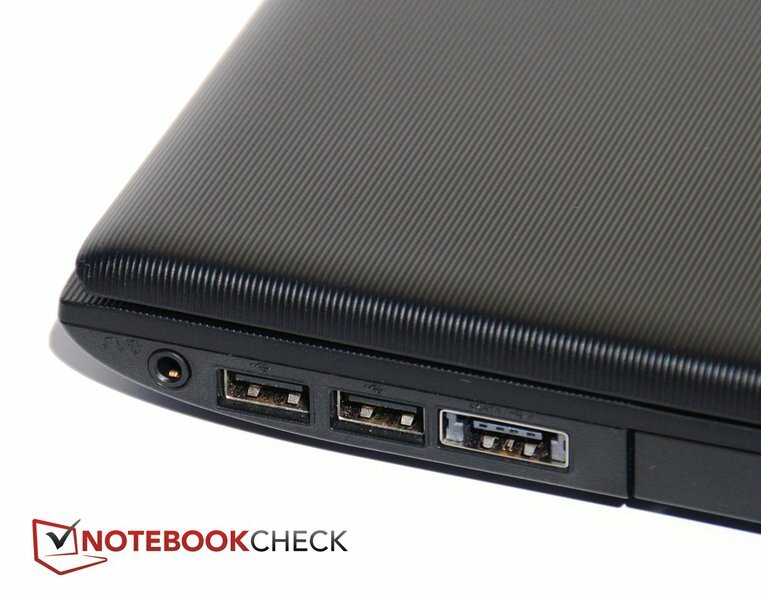 If you prefer to connect a USB 3.0 device rather than an eSATA hard disk, you'll find one on the laptop's other side. There is also a card reader (SD, SDHC, Memory Stick, MultiMedia cards, xD picture) and a VGA port with sufficient space to the USB 3.0 port on the left. 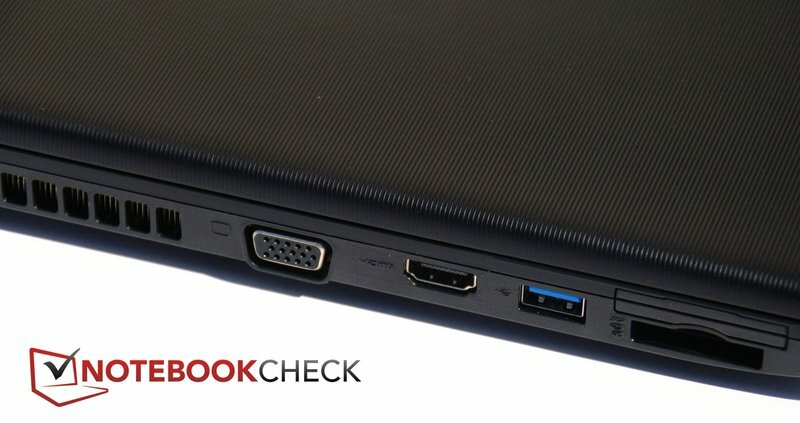 In contrast to the Tecra R850 business laptop, the display port has been replaced by a HDMI socket. Toshiba has only made cutbacks in the audio sockets, and so microphone and headphone now have to share a jack on the front right. The front positioning of the ports could be rather inconvenient. The usable room on the desk beside the notebook could be strongly limited when several cables are connected. The Satellite bids WLAN b/g/n and Bluetooth 3.0 +HS as wireless communication options. The aforementioned Gigabit LAN is also onboard. Regrettably, there's no option for mobile Internet via UMTS, although there is a covered slot for a SIM card in the battery compartment. 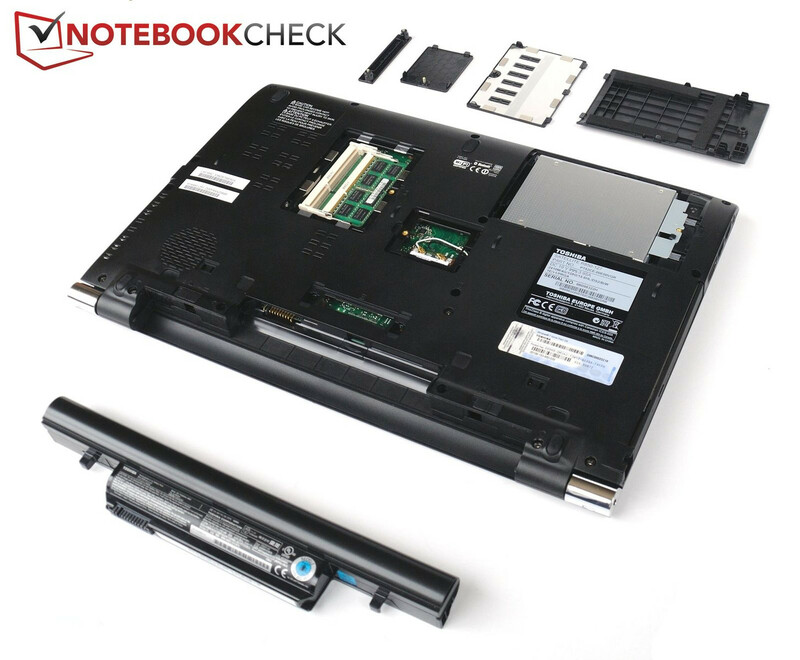 The standard warranty for the notebook is limited to two years including onsite service in Germany and Austria. It can be extended to 4 years with onsite service for the next business day across Europe for up to 190€. 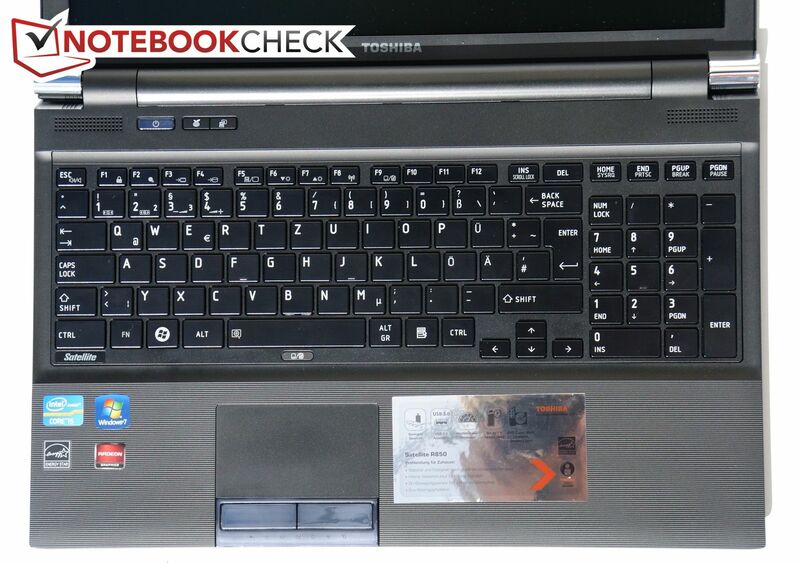 Toshiba has opted, alike many other manufacturers currently, for a chiclet design keyboard. Thus the keys are inserted singly in the base unit. The plane keys make it difficult to not hit the gap between two keys. A numpad is available for entering numbers quickly. The status LEDs for num-lock and caps-lock keys is a handy feature. The key drop is rather short, but the clear pressure point lets the keyboard look good. The keys clatter a bit when typing fast, but the noise is still on an acceptable level. We adversely noticed that the space key on our sample responded poorly in the front right corner during the test. This resulted in several typos, which had to be corrected by pressing the key's center. On the left side of the speaker opening, beside the power button, there are also two hotkeys. 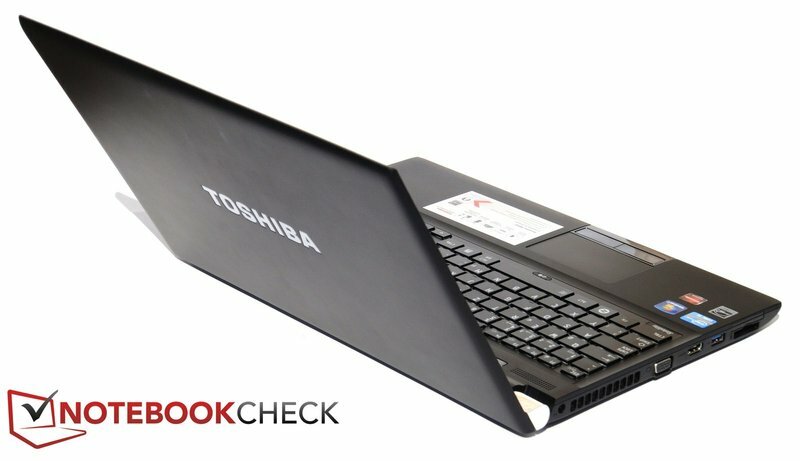 One opens Toshiba's eco Utility that displays the laptop's approximate power consumption and the clearly arranged, advanced settings for energy savings. The second key opens the Windows 7 display switch that is also available via the key combination Windows + P. It enables you to change among various monitor combinations. The touchpad has all familiar multi-touch features. You can zoom, rotate and scroll with two fingers. It is also haptically well separated by the recess compared to the wrist rest and responds precisely to movements up into its corners. Moreover, the driver software bids a large selection of additional features, such as moving back and forth in the browser. 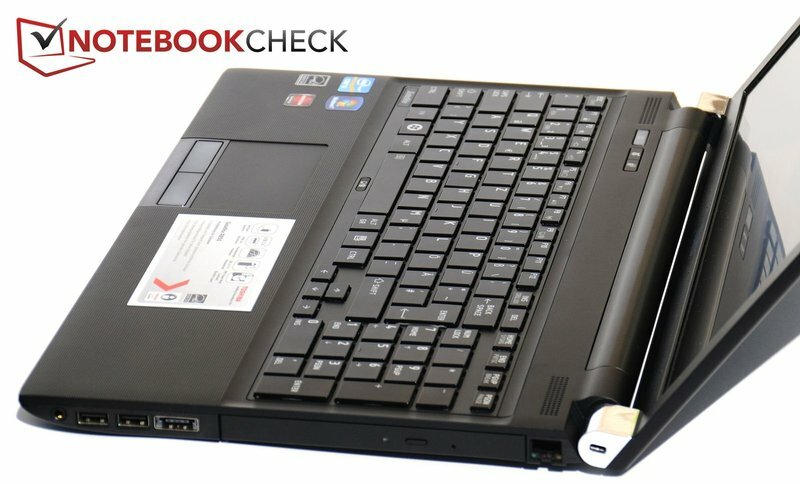 In any case, it's advisable to take a closer look at the software and disable all unnecessary functions because the laptop's behavior might surprise you otherwise. The touchpad can be disabled and enabled with a hotkey located between the keyboard and touchpad when an external mouse is used. The mouse replacement key hardly gives any reason for positive critique. The typing feel isn't bad, but the key emits such a loud, cheap sounding noise that you quickly get used to clicking on the touchpad (via finger tap). Moreover, the keys have a glossy finish and show fingerprints very clearly. Keyboard and mouse replacement are the same as in the Tecra R850 - except for two things: The Satellite neither has a trackpoint nor a fingerprint reader. The installed display works with a resolution of 1366x768 pixels. A rather scanty configuration seeing that other manufacturers often supply a lot more in this price range, for example 1600x900 pixels. 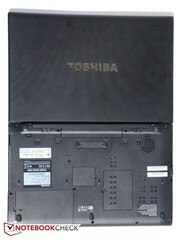 The matt screen also comes from Toshiba and is called TOS5091. The average brightness of nearly 250 cd/m2 is pretty good. It decreases from 268 cd/m2 on the right to 231 cd/m2, but the naked eye won't likely see this. However, the high black value together with the contrast of only 121:1 is awful for a device that wants to also appeal to a multimedia-eager consumer. The AdobeRGB color spectrum doesn't come close to being covered, as expected. 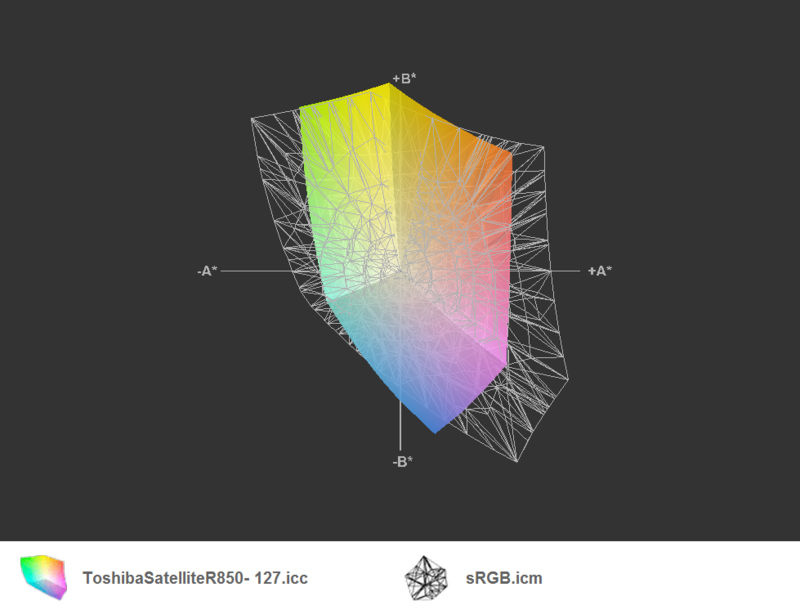 It's just about the same with the less demanding sRGB. But this will likely not be an issue for most users because it usually only plays a role in professional image and video editing. 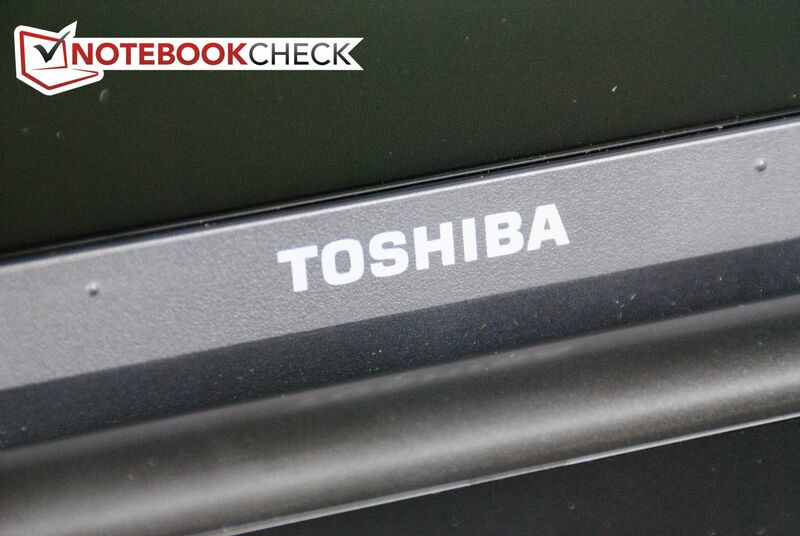 In contrast to the Tecra R850, Toshiba has chosen a different display. Fortunately, we notice an improvement compared to the old screen. The Satellite's screen is a lot brighter and the illumination is also more homogeneous. As can be seen in the color gamut comparison, the Satellite's color space is also a bit wider. Basically, the display can score with a matt surface in outdoor use. It prevents unwelcome reflections. In direct sunlight, the brightness is no longer enough to present the content legibly. Nevertheless, it's possible to work with the notebook fairly well when the position to the annoying light source is selected cleverly. 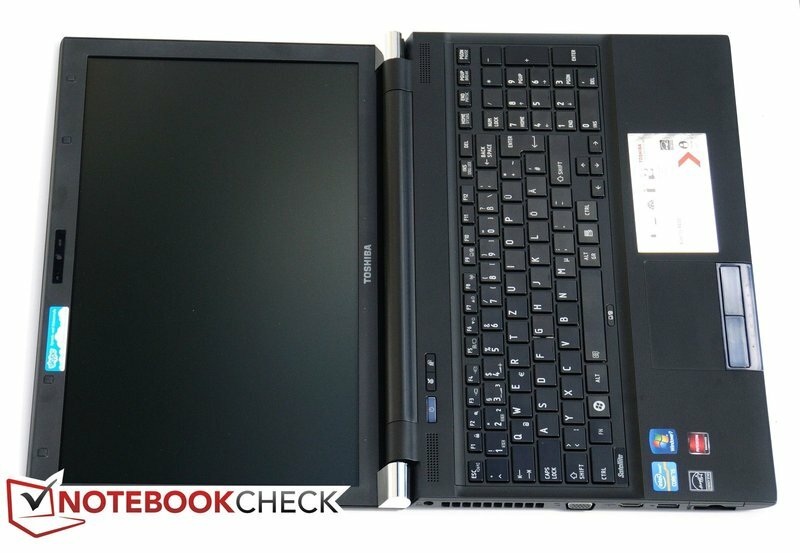 The screen's viewing angle stability isn't particularly good, but compared with other laptops from the same category it's not that bad either. The picture remains well visible for a long time in horizontal deviations. But only very misrepresented pictures can be seen along the vertical line of sight in strong deviations. 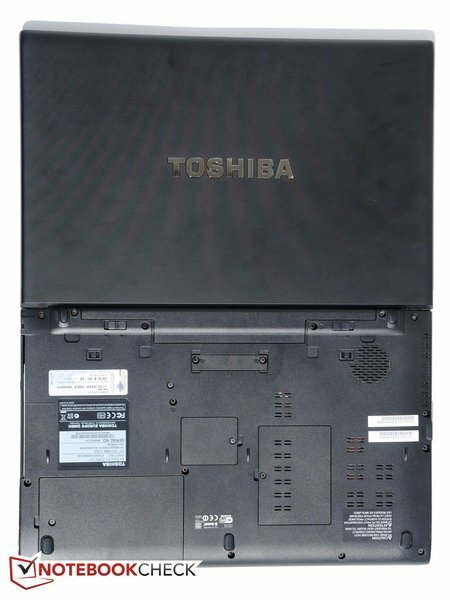 Toshiba releases the Satellite R850-127 with state of the art equipment. The Intel Intel Core i5-2410M processor is to be placed in the upper midrange because it can serve with quite a bit of performance reserves, owing to Hyper Threading and Turbo Boost 2.0. An AMD Radeon HD 6450M is used as the graphics unit. The entry-level graphics card has a 1 GB video memory and clocks with a frequency of 600 MHz. Regrettably, AMD's graphics solution doesn't offer internal graphics switching to the processor embedded GPU, as known from Nvidia's Optimus. Usually the permanently active, dedicated GPU increases the power consumption and reduces the battery life. The installed working memory is a 4 GB DDR3 module with 1333 MHz. 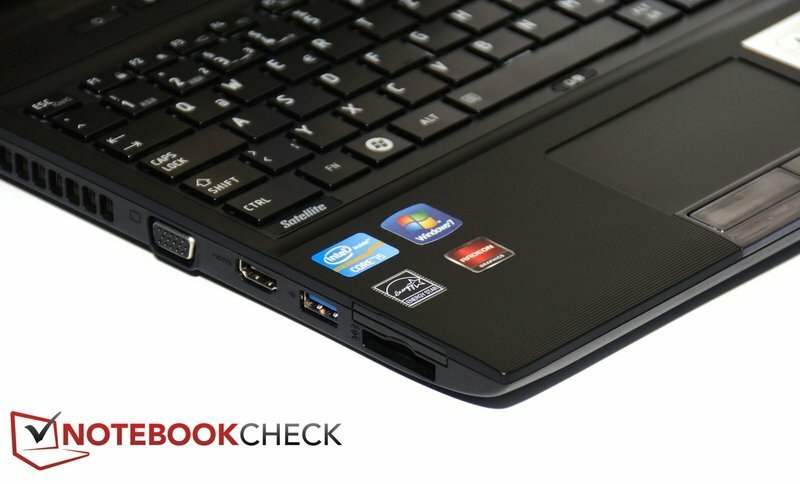 A second RAM bar can easily be added via a maintenance cover on the laptop's bottom. However, 4 GB of RAM should suffice for most applications. 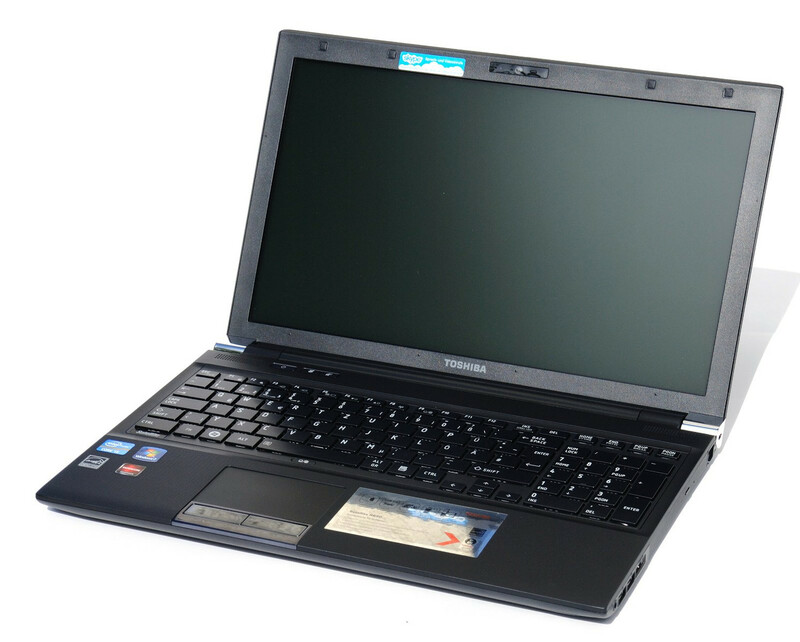 As a special feature, the Satellite R850-127 uses a 128GB SSD for the mass memory. The hard disk is also easy to access via a maintenance cover. Its impact on system performance will follow below. Alternatively to the R850-127, there is also another model from the Satellite R850 range available: The R850-14T. 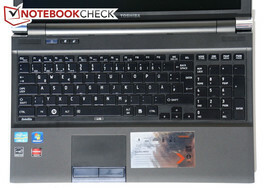 However, this laptop has a conventional 500 GB hard disk and no dedicated graphics chip. In return, the R850-14T is available for starting at 700€ in various shops. The Cinebench runs quickly show that the CPU in this notebook can't exploit its performance limits. Although it doesn't come to the feared throttling, the CPU clock has a hard time surpassing 2.7 GHz and thus doesn't reach the possible 2.9 GHz. The Satellite R850-127 consequently remains in the midfield in the CPU-only benchmarks, Cinebench R11.5 CPU, Cinebench R10 Rendering single and multi. 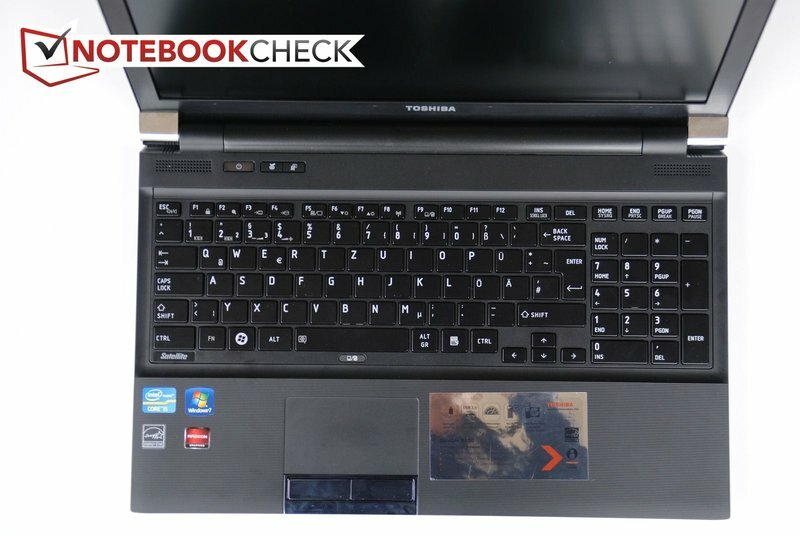 The graphics card pays off in Cinebench R10 Shading and Cinebench R11.5 OpenGL and leaves laptops without a dedicated graphics unit, such as the Toshiba Tecra R850, behind. Nevertheless, the AMD Radeon HD 6450M has to admit defeat in face of Nvidia's popular GeForce GT 540M (Aspire 4830TG) and its bigger brother, AMD Radeon HD 6470M in Sony's Vaio VPC-CA1S1E. 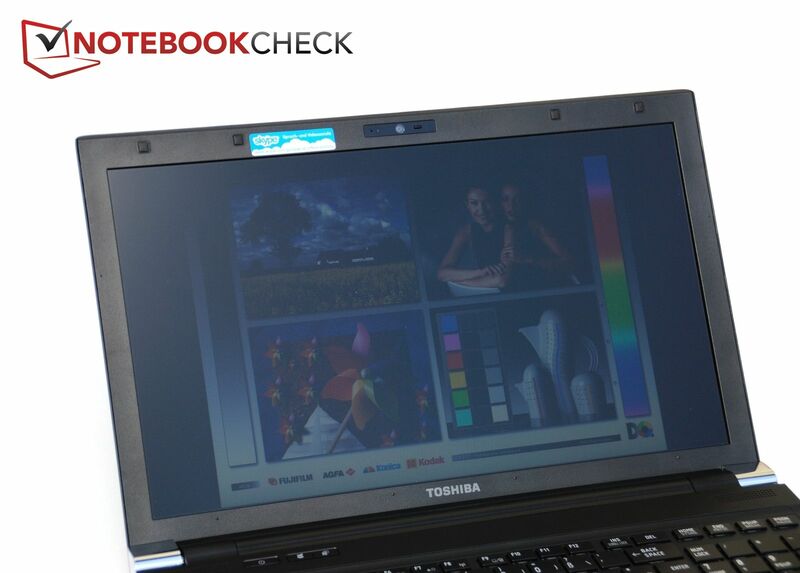 The Toshiba laptop achieves a very high score in PCMark Vantage. 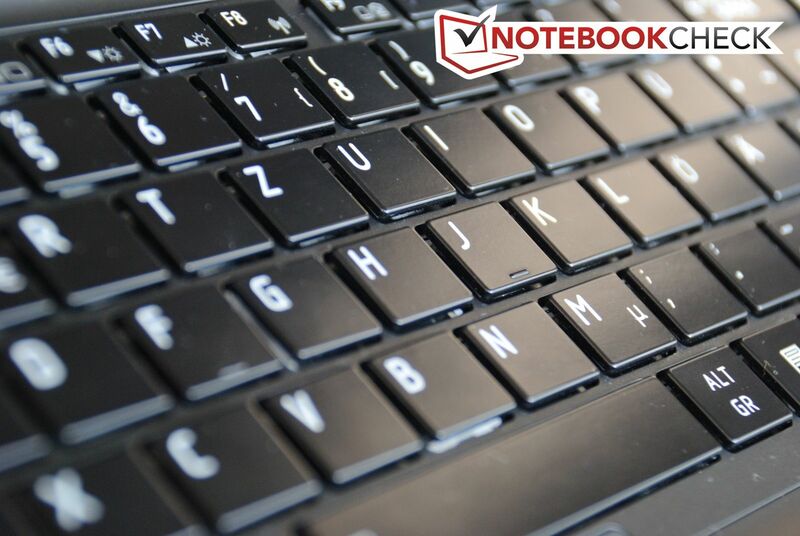 It tops most notebooks with a similar processor and graphics card with 10378 points. This is clearly due to the SSD because it also noticeably accelerates the system subjectively. The desktop appears after only about 15 seconds after pressing the power button. All programs are loaded only 10 seconds later. The shutdown is about just as fast seeing that the laptop is shut down properly after 12 seconds. This again proves that a midrange CPU and GPU can be highly improved by an SSD and the subjective processing speed benefits from it more than with a CPU or GPU upgrade. We can't praise the installed AMD Radeon HD 6450M graphics card in 3DMark much. The score is lower than notebooks with an Nvidia GeForce GT 540M in all cases and partly can't even compete with laptops that have an Intel Core i5-2410M and embedded Intel HD Graphics 3000 solution. So, it can be questioned if using a dedicated graphics card makes any sense at all here. Now we come to rating the installed SSD. 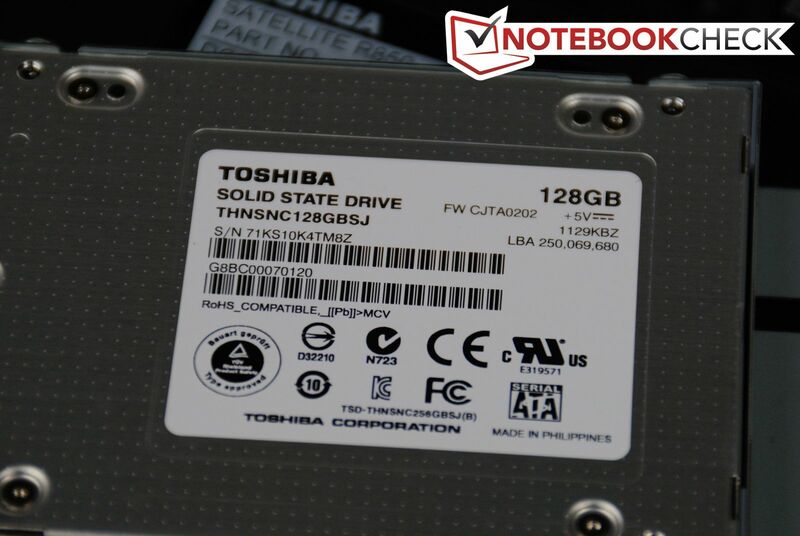 It is a Toshiba solid state disk, model number THNSNC128GBSJ. The user has a net of 103 GB available from a total of 128 GBs. It's not surprising that the SSD leaves the rotating HDDs behind with a write, respectively read rate of 170 respectively 180 MB/s and an access time of 0.4 ms. But how does the SSD fare when compared to other flash memories? The SSD isn't quite as convincing here. Its write and read rates aren't bad, but can't keep up with the popular OCZ Vertex 3 series that has an average transfer rate of about 300 MB/s. The memory also lags behind competing products in the critical 4k tests. 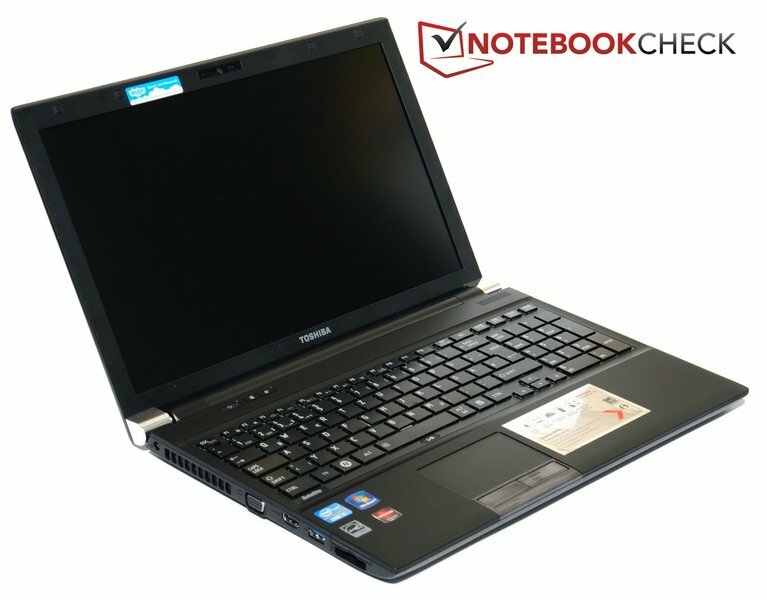 Although the Satellite R850-127 is not the typical gaming notebook with its average equipment, yet ample variety of connections and good workmanship, we will briefly deal with the laptop's gaming suitability here. We tested it in a short game of Battlefield Bad Company 2, Call of Duty Black Ops and Dirt 3. Summarizing, it can be said that most games should run smoothly in the lowest settings. But if it's still fun to play your favorite game in a resolution of 800x600 pixels and without attractive graphic effects is something that you have to decide yourself. See our game list of mobile graphics cards for more information about the installed AMD Radeon HD 6450M. The notebook also benefits from the noiseless SSD in terms of system noise. 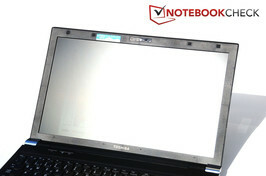 The notebook stays constant at 31 dB (A) in idle and less demanding applications and is almost inaudible. The fan increases its speed considerably during load and thrusts the notebook into the upper field of noise emissions. As a consolation, we can say that the fan noise stays constant and doesn't get annoying by pulsing or permanently turning itself on and off. The fan quickly reduces the speed to its hardly audible state again with decreasing demand. The laptop remains pleasantly cool in idle and doesn't exceed 28°C. The wrist rest are only about 3°C warmer than the ambient temperature with 21°C and 22.4°C. 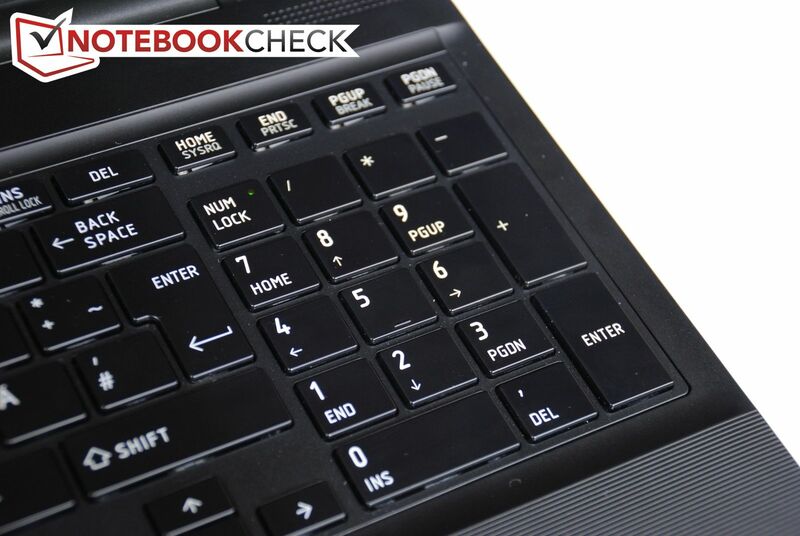 The touchpad gets unusually warm, and can be confirmed subjectively with the measured temperature of 27.7°C. Although this is irritating at first, it doesn't particularly disturb use. The Satellite reaches a maximum of 25°C during low load. This rate even allows using the device on your lap. 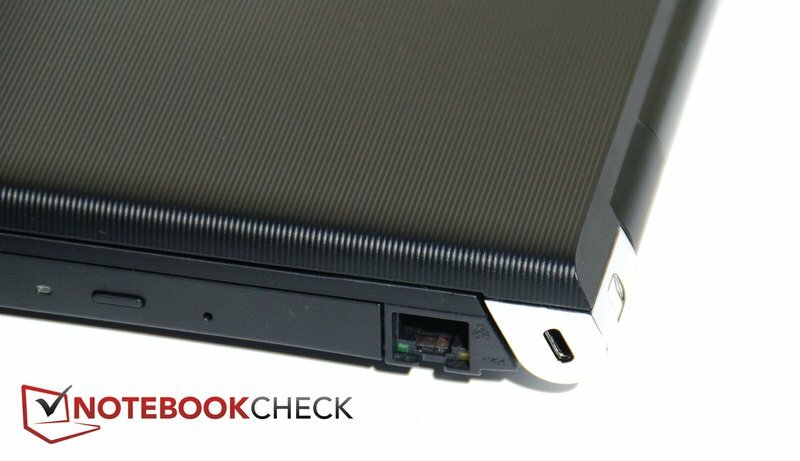 The laptop mainly heats up on its left side during load. While the wrist rests stay fairly cool at 33°C, the R850-127 heats up to 43°C on the left above the keyboard. Even if it is very unlikely that a hand will rest here, it is a high temperature for the top. 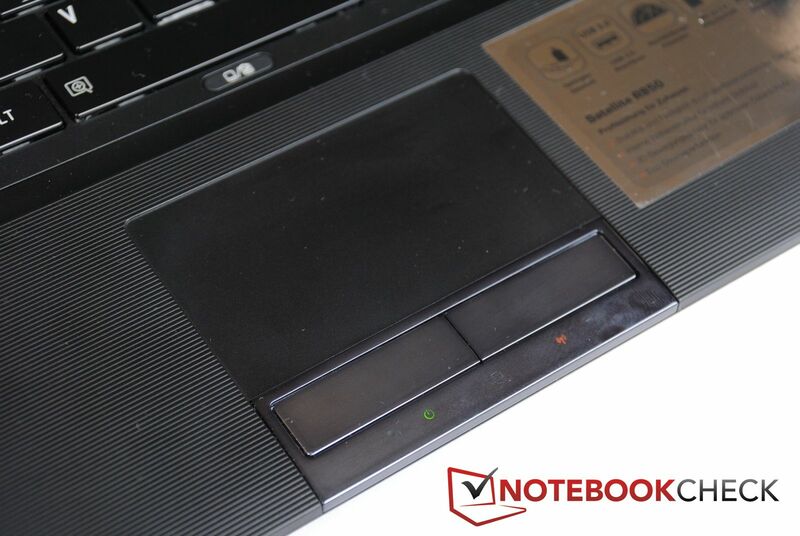 Analogous to that, the notebook's bottom heats up to about 41°C in the center. Here you clearly notice the heat when the notebook is used on the lap. 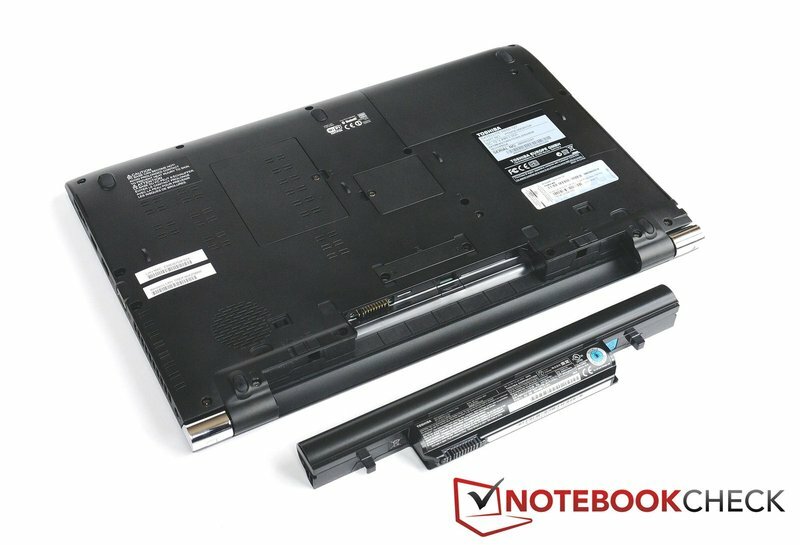 It is recommendable to use the laptop on a solid surface in this state, so to also ensure a better cooling. The processor and graphics card are loaded for over an hour in the stress test (Furmark, Prime95). The notebook puts up a good show here. The measured temperatures stay far below 100°C with a maximum of 84°C (estimation HWInfo), and is thus within the green field. However, the manufacturer seems to have throttled the CPU a bit because it doesn't exceed 2.7 GHz. Both speakers are located between the keyboard and display underneath the perforated pattern made for them. Classical music, as well as rock and pop tracks aren't enjoyable. The notebook can only play techno and house adequately - but without bass, mind you... Thus, you shouldn't have high expectations here, either. The R850 should preferably be connected to an external sound system or used with headphones for movies and music. The power consumption during normal use is within the expected range. With 10.9 watts, it is only slightly higher than that of the Tecra R850 in idle with maximum display brightness and disabled WLAN module. In return, the 15 incher consumes quite a bit more power during load. The notebook needs an average of 48 watts in 3DMark 2006. The Satellite needs 64 watts to work during full load in the stress test. 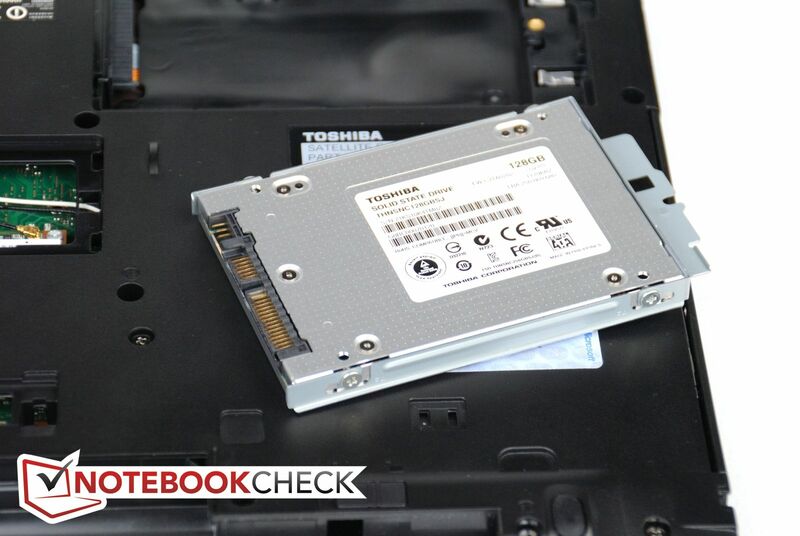 Toshiba uses an exchangeable lithium ion battery with 6 cells and a capacity of 66 Wh. It keeps the R850-127 going for over seven and a half hours in the most favorable conditions in the BatteryEater Reader's Test. 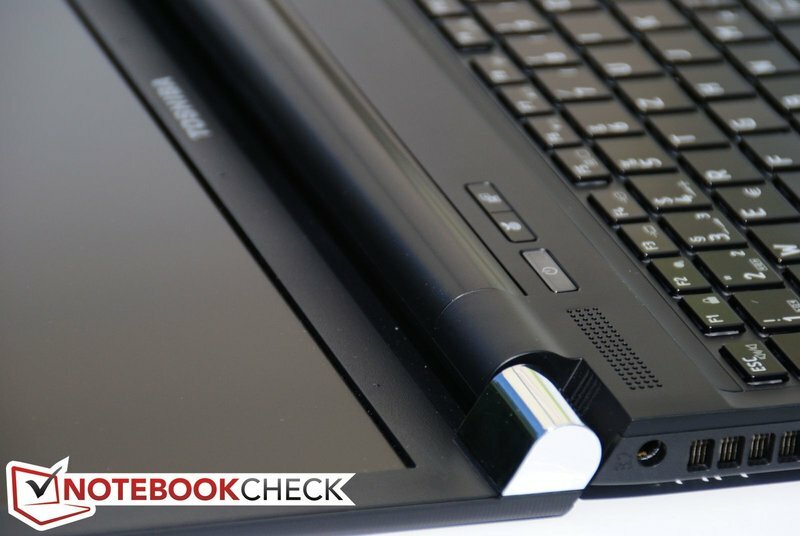 The laptop surpasses the battery life of seven hours that Toshiba states. However, the determined maximum rate is only achieved in idle with decreased display brightness and without WLAN use. 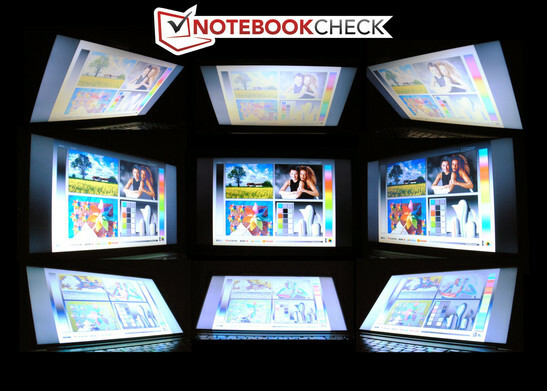 The notebook lasts for a bit less than five hours in practical Internet surfing with adapted display brightness and enabled energy saving mode. The laptop finishes DVD rendering in maximum brightness with over 200 minutes. Star Wars - Episode III doesn't even play that long (140 minutes). But if you'd like to watch Lord of the Rings - The Return of the King (192 minutes), you should have a fully charged battery. The Satellite manages a runtime of 84 minutes in BatteryEater's Classic Test with full load and highest display brightness. Not an awesome time, but also not surprising in light of a power consumption of up to 64 watts. 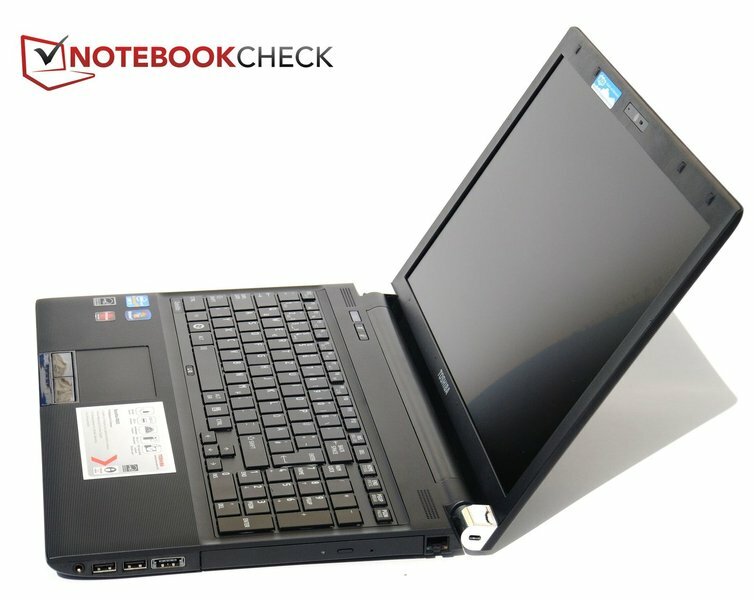 In contrast to the Tecra R850, the Satellite has to accept a minus of two hours in runtime due to the AMD graphics card. Merely the time during load varies by a few minutes. 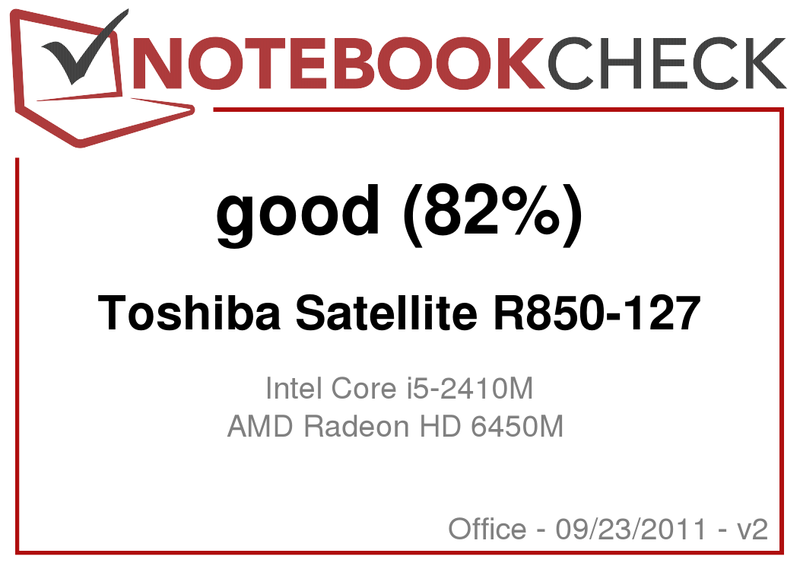 The Satellite R850-127 from Toshiba is a laptop with minor flaws, but all in all it is quite feasible. It can score with its well manufactured and plain case, and provides the user with input devices from the upper midfield. 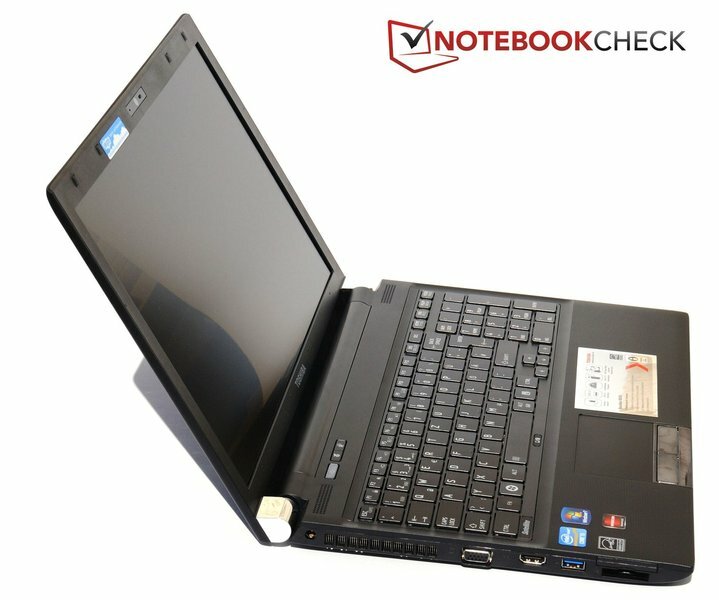 The notebook is ahead of a few opponents in terms of interface diversity because eSATA and USB 3.0 have been installed in addition to VGA and HDMI. Although the display is matt and bright, and thus suitable for outdoor use, it can't be recommended to gamers or multimedia fans due to its poor contrast and color rates. The performance is sufficient for normal home use. 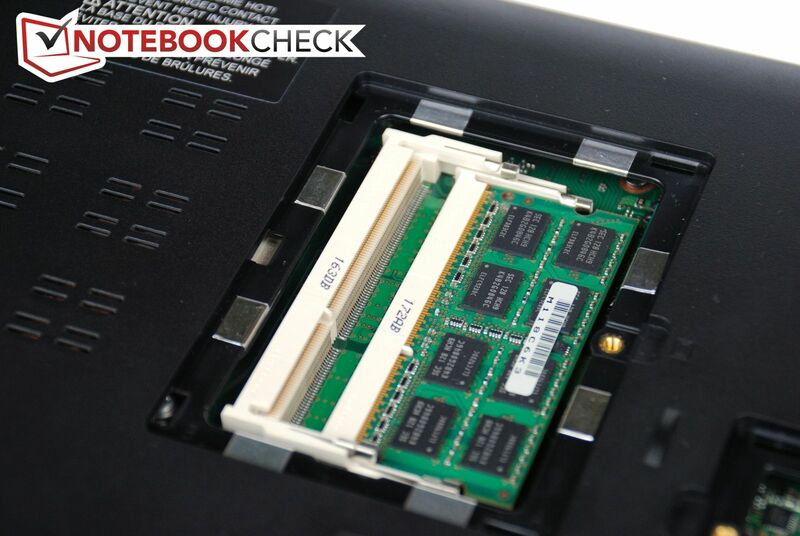 The system is particularly revalued by the SSD that greatly accelerates boot speed and opening programs. If you want, you can take a try at a computer game in low settings every now and again. The noise and temperature development is agreeably low in simple tasks, whereas the fan gets loud during load. The battery life of four to five hours in practical WLAN surfing should also be sufficient for most users. Summarizing, the laptop can be recommended. However, you shouldn't lose sight of the partly considerably lower priced competition. 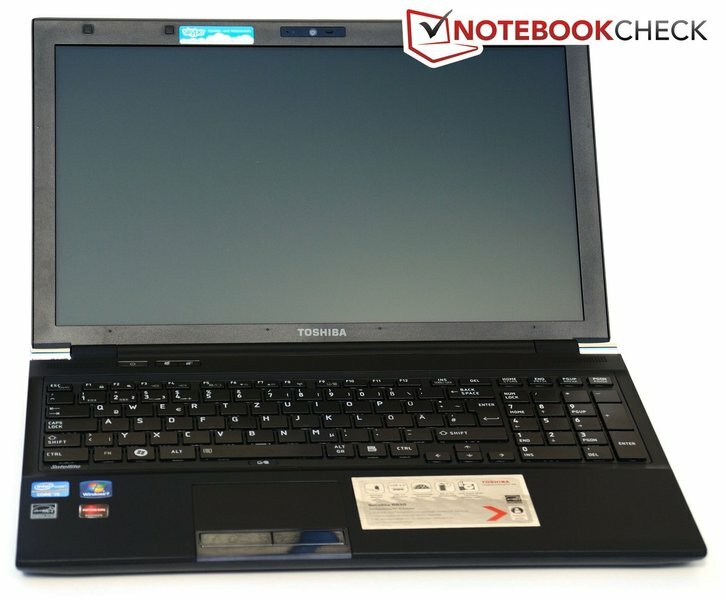 Nevertheless, if you are looking for a cleanly manufactured laptop with good equipment, you might find the right device in the Toshiba Satellite R850-127. 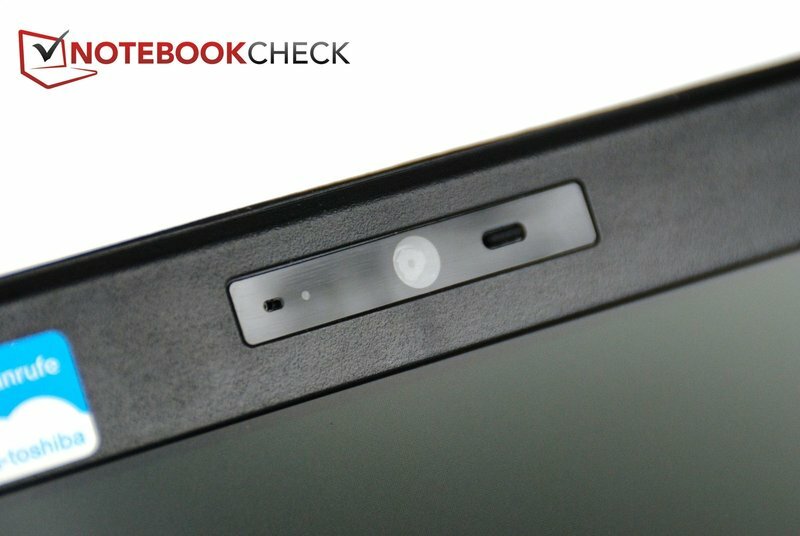 The high-end looks, the SSD performance and the scope of interfaces. A better gaming performance, a more color-eager display and good speakers. 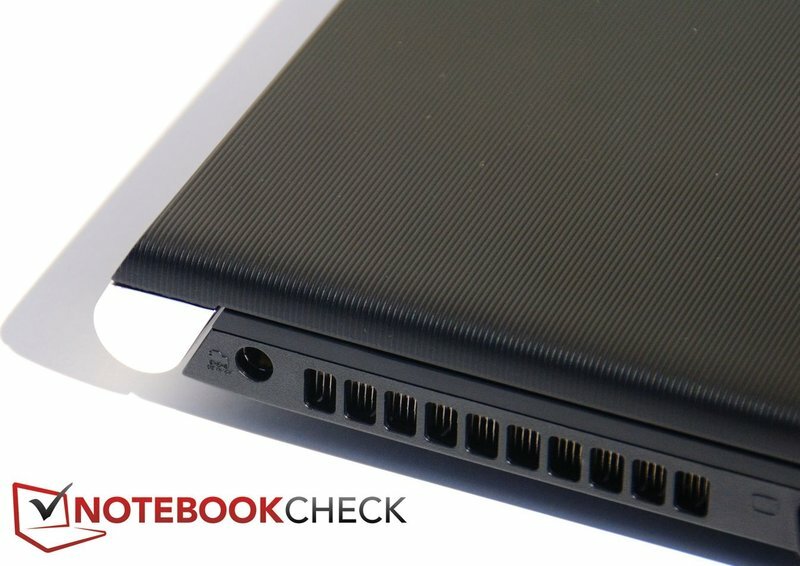 The notebook is currently just as expensive as its big Tecra brother with business features.